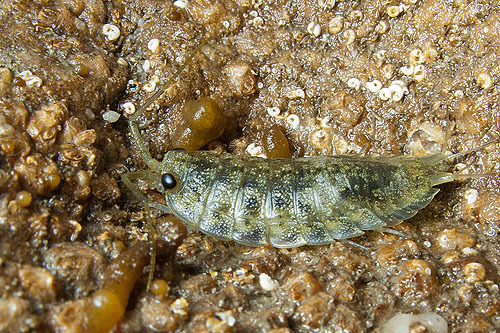 The common sea slater is a sea-shore relative of woodlice that can grow up to 3 cm in length , the largest of the oniscid isopod. It has long antennae, seven pairs of walking legs and two projections at the tip of the abdomen, known as uropods. Sea slaters and other strandline bugs such as sandhoppers, seaweed flies and beach beetles keep the shore tidy by eating dead plant and animal material washed up on the shore. Most active in the evening , during the day they hide under stones and seaweed and in cracks in the rock. Lives for around 2½ to 3 years , usually breed only once in their lifetime (in 3rd year).